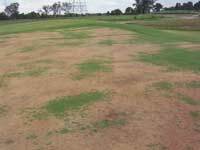 Pythium spp can potentially attack a wide range of turf grass species. This includes many of the widely used cool and warm season turf species utilised in sports turf and home lawns. There is considerable variation in susceptibility to these pathogens with perennial ryegrass (Lolium) and bent grass species (Agrostis spp) being particularly susceptible. When different parts of the plant are attacked, different names are given to the condition caused. When foliage is affected the condition is sometimes termed ‘cottony blight’ or ‘grease spot’. When the crown and root areas are affected terms such as ‘Pythium crown rot’ or ‘Pythium root rot’ are used respectively. The primary causal agent of dollar spot is Sclerotinia homeocarpa. The disease overwinters as sclerotia and as dormant mycelium from the lesions of previous infections. This then acts as the inoculum source for new infections. The onset of day time temperatures ranging between 15 to 27oc encourages mycelial activity with new infections occurring when moved by water and mechanical means. When optimal environmental conditions prevail, infection can be rapid with significant resultant damage to above and below ground vegetative structures. This fungus is classed as a water mold. It survives (overwinters) using a resilient spore structure (oospore). Once suitable conditions prevail, spore germination occurs and infection is perpetuated using mycelial growth which is the fine white webbing seen on moist morning conditions. The organism is very easily moved in surface water and by mechanical means (equipment and footwear). Relative humidity exceeding 90% for more than 9 hours in the same period that conditions 1 and 2 are met. Other factors that encourage infection are soil pH > 7.0, soft growth from high nitrogen fertilisers and poor draining soils. Earliest signs are often small greasy irregularly shaped areas that are slimy to touch. When dry, these patches will have a straw coloured appearance and possibly a reddish tinge. These small spots may join together to form larger irregularly shaped areas and will often follow drainage lines.